The LTTE has clamped a news blackout on attacks carried out by the military’s deep penetration unit within the Wanni and intensified checks and patrolling in areas under its control in the wake of a series of claymore mine attacks in the region. The only two local newspapers published within the LTTE-controlled Wanni have been directed to blackout news about the attacks. 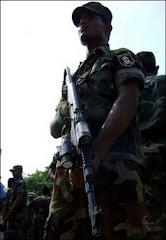 The LTTE “Boarder Force” made up of members of its Civil Defense Force has been directed to be extra vigilant about infiltration of rival groups or the deep penetration units of the military to prevent attacks against their cadres. Before its senior members travel, the LTTE deploys its route-clearing patrols to carry out search operations to prevent any attacks, NGO sources based in the area said. Patrolling is also carried out by the LTTE cadres before civilian movements start between Vavuniya and Kilinochchi as well as other interior main roads. As the security for the LTTE cadres was intensified, another claymore mine attack was carried out by unidentified persons in Nattankandal of Mannar, an uncleared area killing a civilian couple. Last week TNA MP Selvam Adaikalanathan and K. Sivanesan narrowly escaped a claymore mine explosion in Old Murukandy, 12 Km south of Kilinochchi. LTTE’s military spokesman Rasiha Illanthiriyan told The Sunday Times that they were continuing to maintain vigil to prevent any infiltration. “We have killed several of the deep penetration groups in the past,” he said. More than 10 attacks have been carried out by deep penetration groups in the Wanni during the past three months.